Confession: Tuesdays with Morrie had been on my to-read list for years. I could not pick it up because of memories of a family member who passed away due to ALS. I was not sure how I would feel about reading someone living with ALS. Recently, my curiosity took over and I finished the book within a day. Read below why I couldn’t put the book down. Maybe it was a grandparent, or a teacher or a colleague. Someone older, patient and wise, who understood you when you were young and searching, and gave you sound advice to help you make your way through it. For Mitch Albom, that person was Morrie Schwartz, his college professor from nearly twenty years ago. Maybe, like Mitch, you lost track of this mentor as you made your way, and the insights faded. Wouldn’t you like to see that person again, ask the bigger questions that still haunt you? Mitch Albom had that second chance. He rediscovered Morrie in the last months of the older man’s life. Knowing he was dying of ALS – or motor neurone disease – Mitch visited Morrie in his study every Tuesday, just as they used to back in college. Their rekindled relationship turned into one final ‘class’: lessons in how to live. TUESDAYS WITH MORRIE is a magical chronicle of their time together, through which Mitch shares Morrie’s lasting gift with the world. The book is about Mitch Albom and Morrie Schwart and the story is based on actual events. Mitch was a student in Morrie Schwartz’s class. The latter was a Sociology professor. Morrie had always been an inspirational persona that left an impact on its students. Mitch had lost contact with Morrie, despite of their special bond. 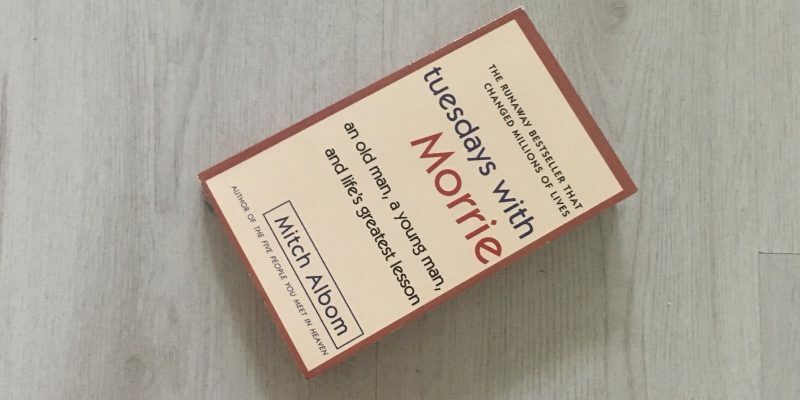 However, when Mitch discovered Morrie was diagnosed with ALS and was going to die within a maximum of five years, he reconnected. Every Tuesday, Mitch visited his old professor and they discussed the bigger themes in life. Morrie lost his bodily functions bit by bit, but with an exceptional grace. He always stayed positive, but above all insightful. With quotes as “The truth is, once you learn how to die, you learn how to live” and “Love each other, or perish” this book discusses the most important things in life from the perspective of someone who is going to loose exactly that. Tuesdays with Morrie grabs a hold of you. It is always incredibly beautiful and sad at the same time to see someone in a dire situation being optimistic, soft and lovable while they have every right to be the opposite. Not once does Morrie act victimized or negatively. What really struck me was that the things Morrie said were on the one hand easy to understand, but on the other hand not always that easy to actually do or live by. He seemed to had really figured it out though. Who is a better adviser on life than someone who is about to leave life anyway?